Posh striker Conor Washington impressed manager Graham Westley in his brief appearance at Bradford City. Photo: Joe Dent/theposh.com. New Peterborough United boss Graham Westley is determined to make the ABAX Stadium a place where opponents fear to tread. Posh host high-flying Bury in a League One fixture tomorrow (September 29, 7.45pm kick off) in Westley’s first home match as manager. He’s confident his team can inflict a first away defeat on ‘the Shakers’ since January 31. Bury arrive at the ABAX in fifth place having won their last five competitive matches. 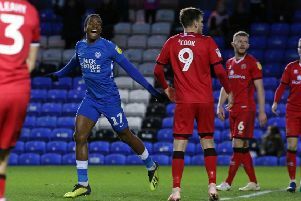 But Posh have taken seven points from their last three games and impressed when winning 2-0 at Bradford City on Saturday (September 26) in Westley’s first match in charge. Westley said: “I’d like my home ground to be a place that people fear coming. I want opponents to know that we are a club that stays together, and I mean the fans as well as the players, for 90 minutes. “The three points should be ours at home. Every thing is in our favour. Our opponents will have travelled which will have an effect and they won’t have many fans in the ground which will diminish them as well. “I want us to play with an energy that teams won’t be able to live with. We will press for 90 minutes and make life uncomfortable. “It’s important never to under-estimate opponents, but it’s just as important that you never under-estimate yourselves. “We should have confidence from taking seven points from three matches and that is a standard we can now build on. “It’s important to learn and improve as individuals and as a team. Winning is a skill you have to learn and it can all be about small margins. “I’d be a liar if I said I wasn’t pleased with the performance at Bradford. We tried to inject some incisive passing into our attacking play and we worked so hard defensively that Bradford had just five shots on our goal - a big reduction on previous matches. “Not many teams will be good enough to restrict Bradford City to that sort of number and to win there so convincingly, but we are one of them because we worked hard and we were organised. Posh are unlikely to change their winning line-up for the battle against Bury. Midfielder Jermaine Anderson remains suspended, while defenders Jack Baldwin and Kgosi Nthle, as well as striker Joe Gormley, are unfit. “Players always have bumps and bruises on a Monday after a Saturday game,” Westley added. “But I know that whatever 11 I pick from our squad, it will be a good 11 because we have so much talent. “We are capable of winning every game we play if we get everything right, We do have a lot of young players who will frustrate us occasionally because inexperience means you sometimes don’t make the right decisions. “We have players with different skills and we will keep trying to get the perfect blends and partnerships. It was just about the starting XI at Bradford as I felt Jon Taylor and Conor Washington played important parts in the win after coming on as substitutes. Posh will have to defend well tomorrow as Bury are the leading scorers in League One with 17 goals in nine games. They are reportedly paying big wages to summer signings Leon Clarke and Tom Pope, two strikers with decent recent scoring records.